We’ve tested 10 fly sprays to see how fast they knock down flies and whether they can kill ’em dead. Summer’s around the corner. That means beaches, beers, barbecues – and flies! We tested 10 aerosol fly sprays and found 6 killed flies dead. However, the “natural” product in our test left more than 80% of them still buzzing. Flies in the kitchen are annoying – not to mention the yuck factor if they land on your food. The fastest solution is reaching for a can of fly spray, but we’ve had complaints from members some sprays don’t do the job. Or, if they do knock the critters down, hours later they’re back up again! We wanted to see how fast the sprays were at knocking down flies and whether the flies were dead after 24 hours. Six sprays killed 100% of the flies within 24 hours, but some worked much faster than others. 4 half-second sprays were released into a specially built chamber measuring 5.8m³ and containing 20 house flies. We timed how long it took for 50% and 90% of the flies to be “knocked down”. Twenty-four hours later, we recorded the percentage of flies that had died. Each test was repeated 5 times for each product. Our test also included a control, where the flies weren’t sprayed with anything. On average, 1 fly died in each control test. 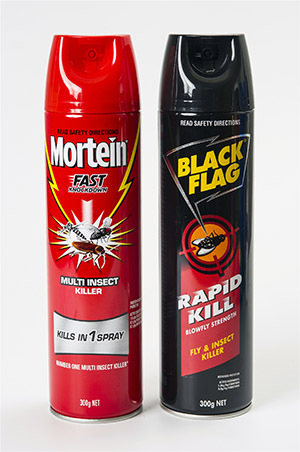 We recommend Mortein Fast Knockdown Multi Insect Killer and Black Flag Rapid Kill Blowfly Strength Fly & Insect Killer. They lived up to their names and were the fastest-acting sprays – both felled 50% of the flies in less than 20 seconds, and 90% in less than a minute. However, their valves released about double the amount of spray in 2 seconds compared with other products, so you’ll go through a can faster. This may also be one of the reasons they worked so fast. The fastest-acting sprays in our test. We also recommend Raid One Shot Multipurpose Insect Killer Odourless and Expra Fly & Insect Spray Low Odour. Both took slightly longer than the Mortein and Black Flag to strike down the flies, but they did the job with less spray, so work out cheaper per spray. Zap Multi Insect Killer Odourless Low Irritant is worth considering. It’s the cheapest product in our test per spray and achieves a 100% kill rate – if you don’t mind waiting more than 5 minutes to knock down most of the flies. If you’re after a “natural” alternative, you’ll be disappointed. Raid Earth Options Fly & Mosquito Killer was the only spray in our test containing natural pyrethrins but it failed to deliver. It took 26 minutes to knock down just 50% of the flies. It didn’t manage to knock down 90% of flies, and after 24 hours 80% of the original flies were still alive. Don’t be fooled into thinking that Mortein NaturGard is a natural product. While it’s fragranced with citronella, its active ingredients are synthetic pyrethroids. The supermarkets were launching their own private label brands, which weren’t available in time for our test. Our test found most fly sprays work to some degree, so why are we hearing they aren’t always effective? We asked parasitologist Dr Allen Heath to give us the facts on flies. According to Dr Heath, there’s overseas evidence flies are becoming resistant to some fly sprays, but no studies have been done here. Even though resistance in New Zealand is possible, he thinks it’s more likely consumers aren’t patient enough to wait for the sprays to work, or they aren’t using them in the most effective way. “You must make sure each fly is hit directly by a spray droplet – don’t just wave the spray in the air and hope for the best,” Dr Heath says. Synthetic pyrethroids, such as esbiothrin and tetramethrin, or natural pyrethrin, which is made from a species of the chrysanthemum plant, are the main active ingredient in fly sprays. These “knock down” agents interfere with a fly’s nervous system, causing paralysis. A fly’s digestive system can break down these ingredients, which is why some recover. For this reason, some products also contain synergists, such as piperonyl butoxide or N-octyl biocycloheptene dicarboximide (MGK-264 for short). Synergists don’t kill the flies but delay the breaking down of the active ingredients, giving them longer to work. Mortein NaturGard and Mortein Fast Knockdown Odourless have the same active ingredients at the same concentration. So why does NaturGard perform better? Spray weight: the amount of spray released per squirt (or valve output) affects the dose a fly gets. Each 2-second spray of NaturGard weighed, on average, 5.98g. Mortein Odourless weighed 4.90g per spray. Particle size: the larger the spray droplets, the fewer there are per spray and the quicker they settle, so they have less chance of coming into contact with a fly. However, if the droplets are too small, they can be deflected while the insect is flying. Projection: a good fly spray should have a projection of more than 2 metres. This increases your chances of hitting a fly. Keep doors and windows closed or install fly screens, especially around the kitchen. Switch on fans – flies don’t like getting blown around. Put outside rubbish and compost bins as far away from the house as possible and keep them covered. Rinse bottles and cans before putting them in the recycling bin. Keep your kitchen clean. Make sure your inside rubbish bin has a lid and is cleaned regularly. Cover or put food away and don’t leave food scraps or drink spills lying around. Keep pet food areas clean and preferably outside. Clean pet food bowls every day and clear away faeces. GUIDE TO THE TABLE Fly sprays = recommended, = worth considering. Price/spray per 2-second spray is based on the price we paid per can. Weight/spray of a 2-second spray. 50% knock down time taken to knock down 50% of flies. 90% knock down time taken to knock down 90% of flies. Mortality percentage of flies dead after 24 hours. Active ingredients from can.